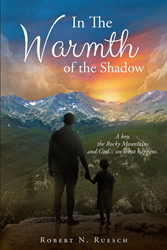 “In The Warmth Of The Shadow” from Christian Faith Publishing author Robert N. Ruesch is a moving story of faith, family and community around the YMCA of the Rockies. “In The Warmth Of The Shadow”: brings readers into the close knit community of the YMCA tucked away in the Rockies. “In The Warmth Of The Shadow” is the creation of published author, Robert N. Ruesch, grew up at the YMCA and throughout the author’s life watched it grow into the successful community it is today. Published by Christian Faith Publishing, Robert N. Ruesch’s new book takes readers through the life of the author and the growth of the YMCA of the Rockies, which now is a world-class resort and one of the largest YMCAs in the world. Growing up at this resort Ruesch received a unique upbringing that shaped the author’s worldview into what it is today. By working at the YMCA the author forged friendships with kids from across the country. While many of these friendships lasted only the summer, they had a lasting impact. Get a glimpse into the life in the Colorado Rockies from the 1950 to 1970 at this unique YMCA and the community that formed around it. Along the way the reader will learn a bit about family, faith, and community. View a synopsis of “In The Warmth Of The Shadow” on YouTube. Consumers can purchase“In The Warmth Of The Shadow” at traditional brick & mortar bookstores, or online at Amazon.com, Apple iTunes store, Kobo or Barnes and Noble. For additional information or inquiries about “In The Warmth Of The Shadow”, contact the Christian Faith Publishing media department at 866-554-0919.